The tool enables users to convert all or specific data items from an Outlook PST file. It supports file of any size having no 2GB file size limitation at time of browsing the database file. Easily transfer all PST mailboxes such as Emails, Contacts, Calendar, Notes, Tasks, Journal items into multiple file format. Convert PST files into EML, MSG, VCF, HTML, MHT, TXT, ICS, Document and Portable Document format. 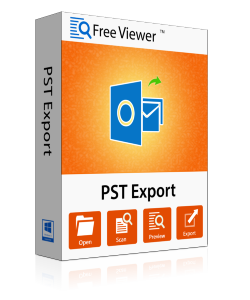 The PST export tool provides a direct alternative to transfer emails of Outlook data file in EML or MSG file format. It moves emails with their respective attachments in the same format as they were before PST to MSG, EML conversion. PST to vCard converter tool is providing a separate option to save Outlook contacts separately in VCF format. One just needs to select VCF option and then, the PST Export software will automatically save PST contacts in vCard format. Users can save emails in Adobe portable documents with their attachments of Outlook 2016, 2013, and all below versions. In addition to this, a header option is also provided to export the technical attributes of each PST mail. PST to MSG exporter enables clients to transfer only wanted items of MS Outlook. It is not compulsory that they will have to export all items of browsed PST file. Only desired mailboxes/emails are being enabled for customized conversion. The PST Export utility quickly scans the browsed file mailboxes and loads them on software screen. All the extracted folders get loaded on the left-hand side. Click on the desired folder to view entire data of Outlook mailbox. It is a quite obvious fact that users want to save a file in the desired format. Therefore, this PST export tool is rendering more than 5 choices to save output file in the desired name. One can also store files at any targeted location with help of this tool. Trial Version of PST Export Software Preview all the PST Items & Export 25 Items/Folder. If you are using Window 10/8.1/8/7 or Vista, then please launch the tool as "Run as Administrator". Can I convert PST to MSG files for free with help of your software? Yes, our PST Export software is available in a trial version to test the product before purchase. You will be able to export 25 emails per folder through our free PST Export tool. To export all data of each folder, you have to leverage for the licensed version. Being a novice user, can I use your PST to EML Exporter? Yes, prior to any technical knowledge, you can operate our product without any hassle. To understand the ease level of working, you can first try free edition. Once you are satisfied with functioning opt for full version through its purchase. 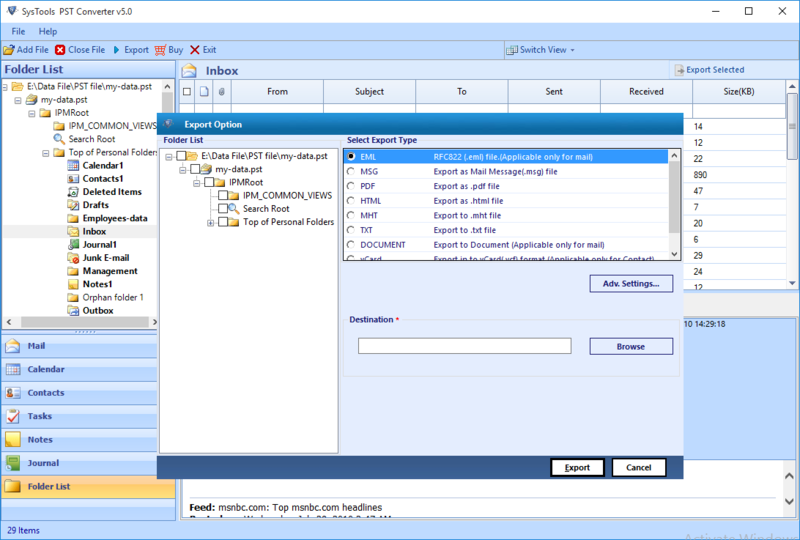 What are the prerequisites of the system to export Outlook contacts to VCF file for freeware? There are no prerequisites of this PST to VCF converter software. The application is the standalone utility, which does not require any application for support. How can I use email filtering feature provided in your PST Export utility? To utilize this feature, check all those messages that are to be exported. After that, right-click on the same wizard and click on Export button to achieve mail filtering feature. Is there any date-based filtering feature provided in your PST to MSG exporter? Yes, in Export window you will find an option of Mail Filter. You can utilize this option for transferring Outlook emails of certain time duration. "FreeViewer had done a great job by developing this PST to EML export product. The software exported all my messages with attachments without any loss and within few minutes, all Outlook messages were in .eml format. I am very much impressed with your PST Export product and will definitely recommend it to all my friends." "PST Export Tool is brilliantly designed with all useful features within it. What I like about this software is ease of working with it. Manually, it is too much complex to convert PST contacts to VCF format. But, when I used this product it has now become easy for me to save Outlook address book data separately on my PC." Copy Outlook for Windows emails to a Mac computer and migrate them to multiple file formats. Create a single MBOX file for each PST file containing multiple emails. Extract multiple messages with attachments from an Outlook data file(.pst). Save them to individual email files in EML, EMLX or MSG format. Transfer a complete email folder from Outlook to Apple Mail MBOX format using the tool. There is no file size limitation on the PST file that can be uploaded to the tool. Upload one file at a time using the Add File option. Or import multiple .pst files in bulk using the Add Folder option. The PST files must be in UNICODE format and in healthy condition. There is an option provided by the Mac PST Migration software to restrict email conversion based on a date range. This will migrate emails based on a ‘to’ and ‘from’ dates and prevent any needless migration of data. This restriction is applied on the date the emails were received. This option saves time and efforts when migrating a large email folder. The Mac PST to EML Converter makes it optional to keep folder structure in resultant emails. This means that if a .pst file has multiple email folders then, some emails may not adhere to the original folder hierarchy. The Export PST to EML software ensures data integrity and maintains folder structure by default. The PST to MSG Converter provides different naming conventions for the output emails. The individual exported message files can be named based on serial number, subject or date. 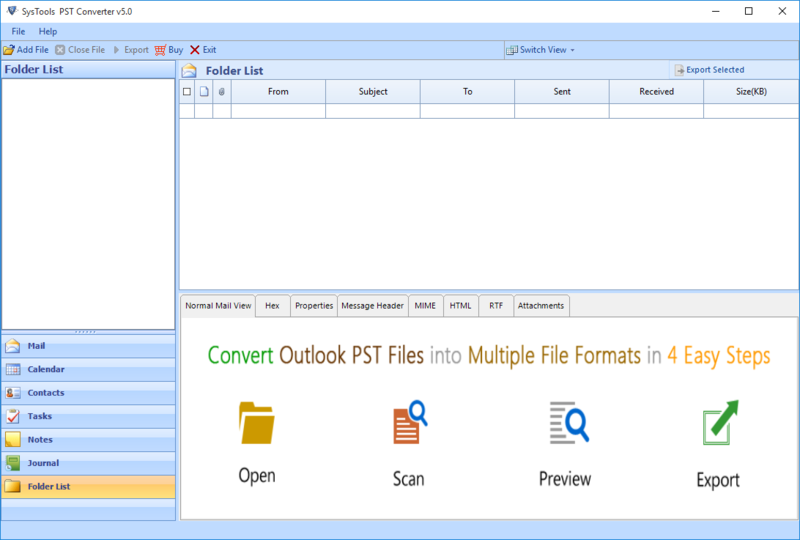 The Outlook message to EML converter transfers emails without any changes or data loss. It is a completely secure and safe tool to use. The Convert Mac PST to EMLX utility is a reliable and relevant tool. A complete progress report is generated at the end of the conversion process. This can be saved in CSV format to be accessed for future reference. The Convert Mac PST to EML software has a simple and easy-to-use graphical user interface. The PST to MSG Converter works with all the latest versions of Macintosh operating system. It is compatible with Mac OS X 10.8(Mountain Lion) and 10.9(Mavericks). The Convert Mac PST to EMLX also supports Mac OS X 10.10(Yosemite) and Mac OS X 10.11(El Captain). This also includes the Mac OS X 10.12(Sierra) and Mac OS X 10.13(High Sierra). Trial Version of Mac PST Export Software Preview all the PST Items & Export 100 Email and 25 other items. Is there a file limitations to the number of emails that can be saved PST to MSG format? No, there are no limitations on the number of emails that can be extracted from Outlook PST file and saved to MSG format. 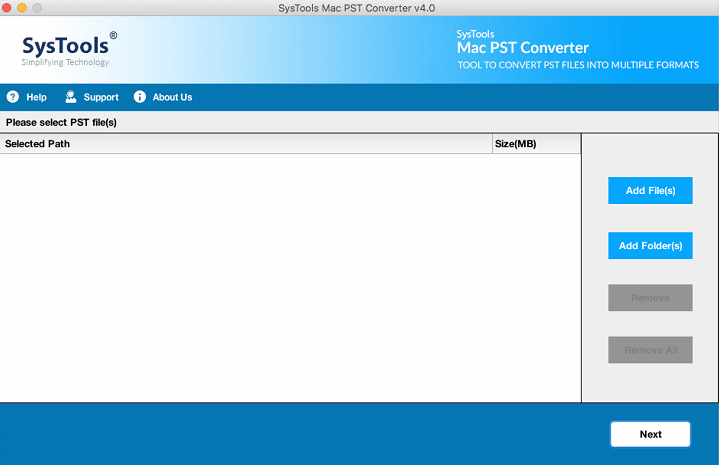 Can the Mac PST to EML Converter tool work with ANSI type PST file? No, the Mac PST Export tool supports only UNICODE PST from Outlook 2007, 2010, 2013, 2016. What is the difference between the free and the full version of the tool? The Outlook to Apple Mail free Converter has all the features of the full version. The only difference is that the free one can migrate only 25 items per folder. 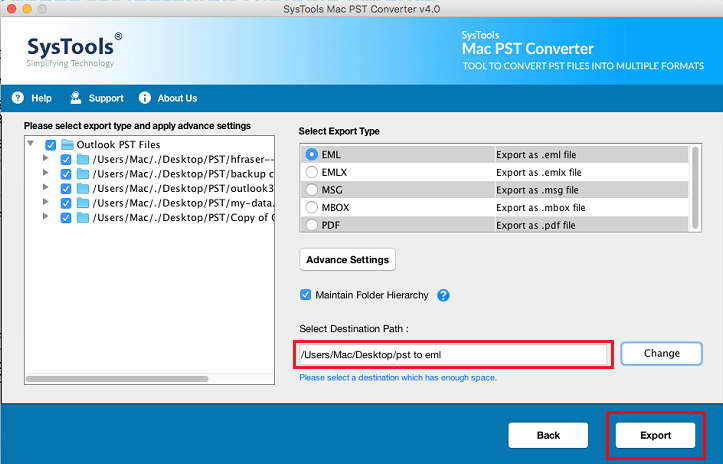 Can the Mac PST to EML Converter transfer corrupt data file(.pst)? No, the Mac PST Export tool can only work with a healthy .pst file and not with a damaged/corrupt or infected file. Can this tool work with Outlook for Mac data files? No, the Convert Mac PST to EMLX supports only PST files from Outlook for Windows(32 or 64-bit). 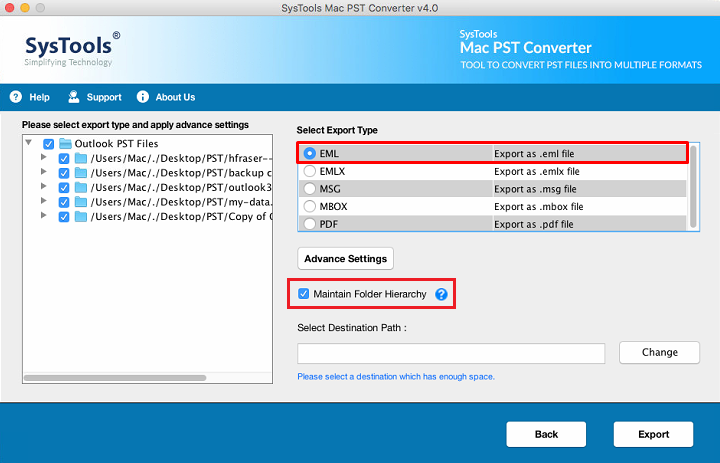 The Mac PST Export Tool helped us save a lot of trouble by directly migrating bulk .pst to MBOX format. We were able to convert our services from Outlook to Thunderbird easily. The PST to Apple Mail Converter ensured that even the email formatting was kept intact. We tried the free version too, which was clean from viruses or malware. It was secure to use. 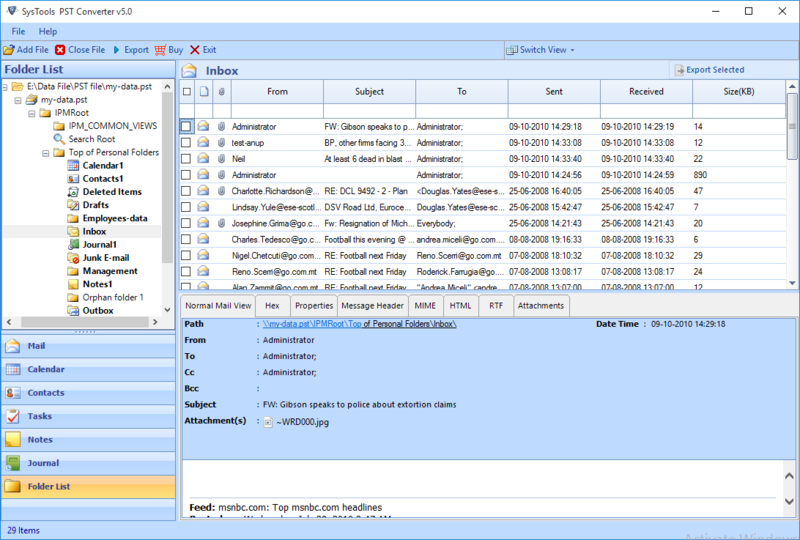 The Outlook to EML Converter has extracted our thousands of emails in .eml format. Now, these emails can be viewed through a browser window anywhere on a Mac OS computer, Android or iOS mobile. The Export PST to EML tool can preview each email item on multiple devices including smartphones, mobiles, tablets etc. The Outlook PST Export Software has combined the functionality of data migration and transfer across platforms. I was able to read emails saved in an old .pst file from my Windows PC on a Mac computer. 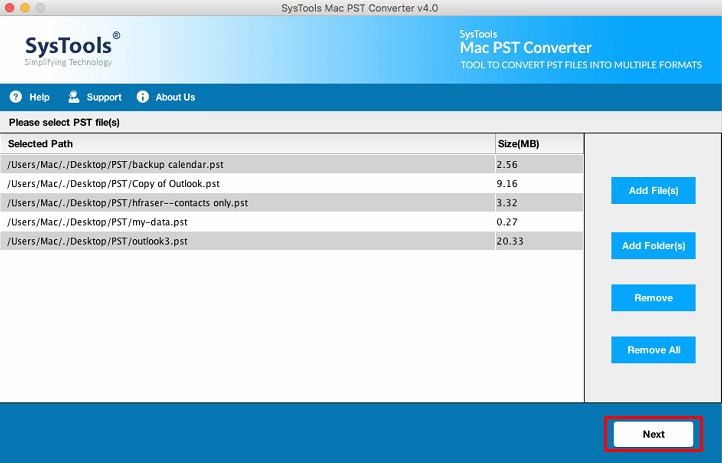 The PST to MSG converter has made it possible to read Outlook for Win emails across platforms on a Mac OS. Thanx! The Convert Mac PST to EML tool is build with multiple options for saving .pst file. It allows a user to read emails from an Outlook data file(.pst) on Mac machine. 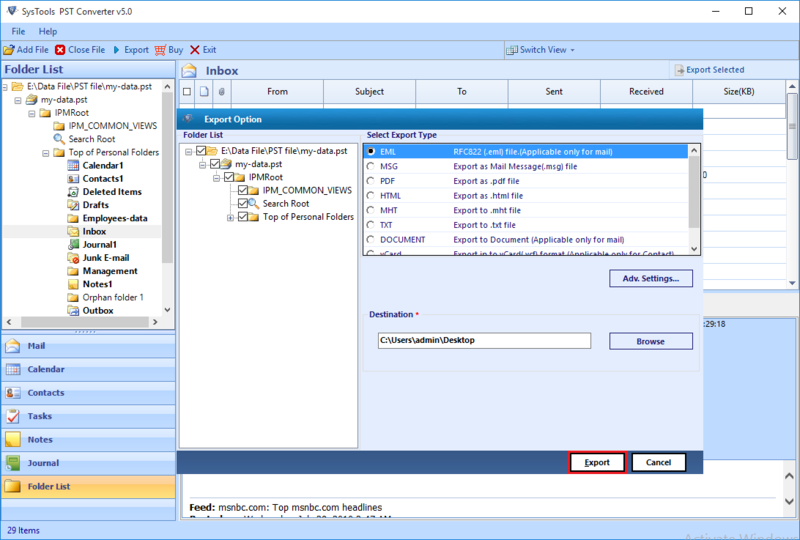 The Export PST to EML tool can be used to bulk transfer multiple emails to MSG format. This makes data migration to Outlook Express a lot easier.